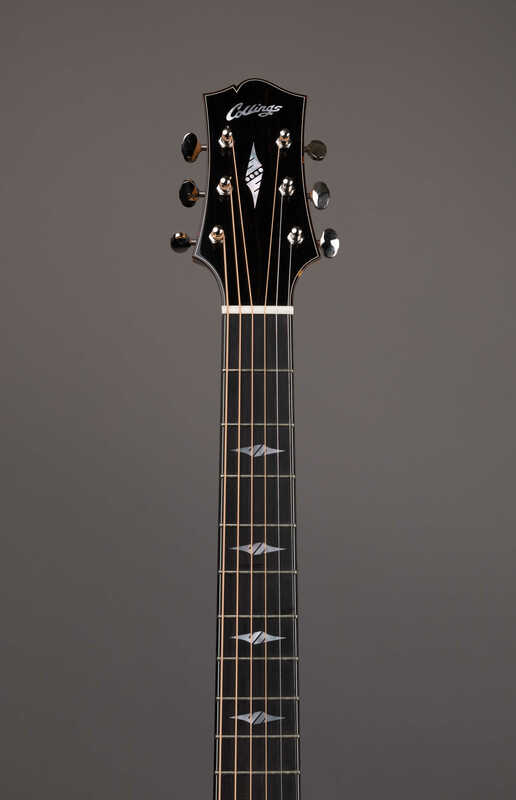 The SJ is the Collings version of what is commonly called a small Jumbo. 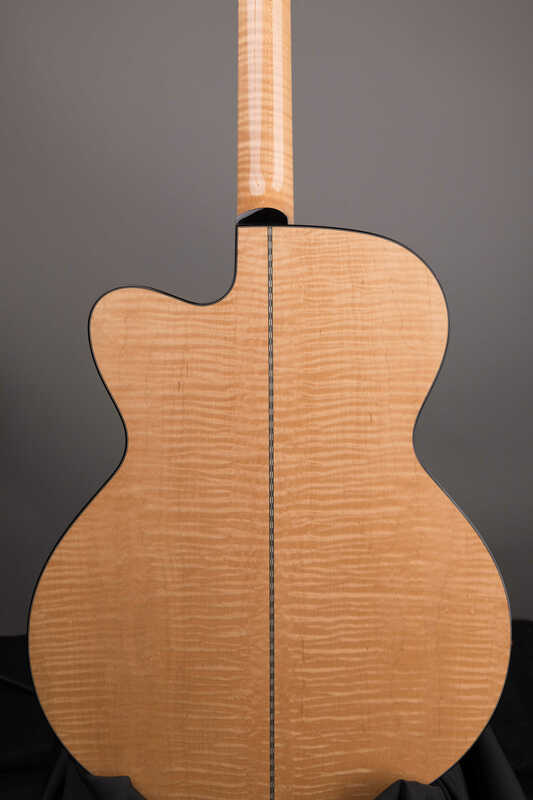 Although the 16 inch lower bout is slightly wider than a dreadnought, and the sides almost as deep, the tight curve at the waist creates in a very different sound chamber. 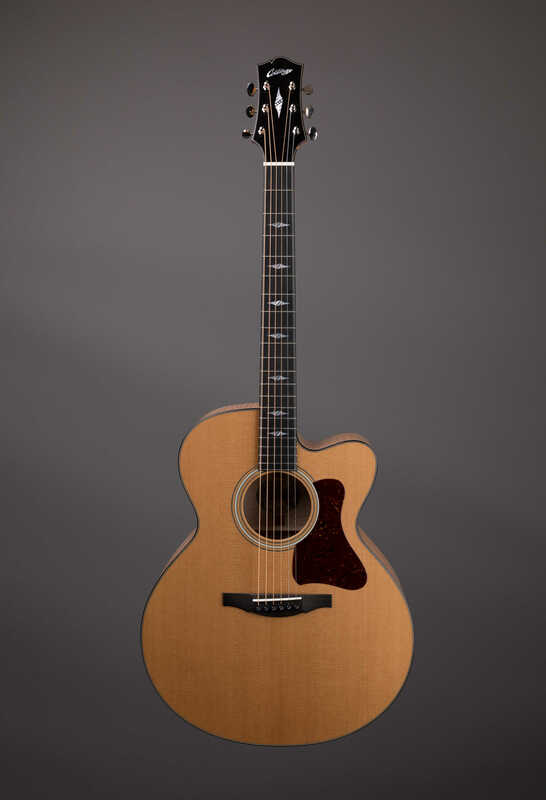 SJ's, especially examples in maple, typically have a more pronounced midrange response when compared to a dreadnought, making them ideal candidates for a rounded cutaway. Players looking for the bass and overall volume of a large guitar, but with lots of treble clarity and midrange crunch, often find just what they need in the curvaceous SJ. HARDWARE Premium Waverly open gear tuners offer exceptional tuning stability and smooth reliable operation. SJ APPOINTMENTS The SJ features a fully bound top, back, neck and haircut-style peghead with black/white top purfling. 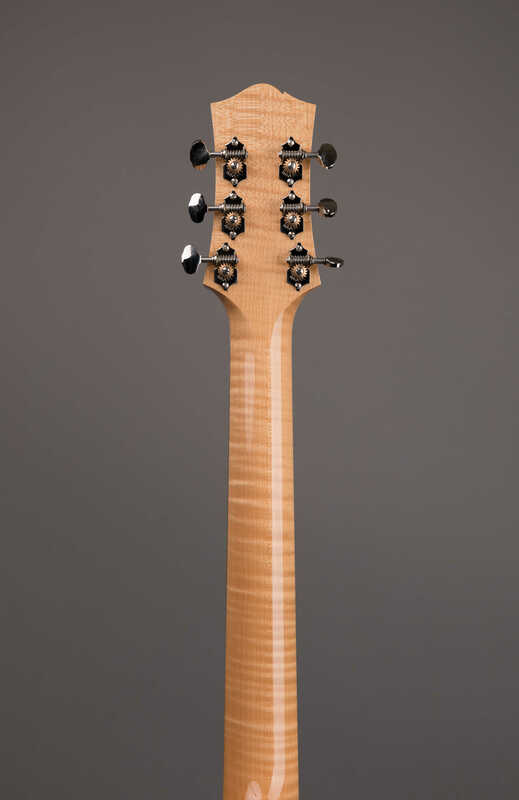 SJ NECK PROFILE Each SJ features a comfortable medium-fat C shaped neck profile with 2 3/16 inch string spacing. 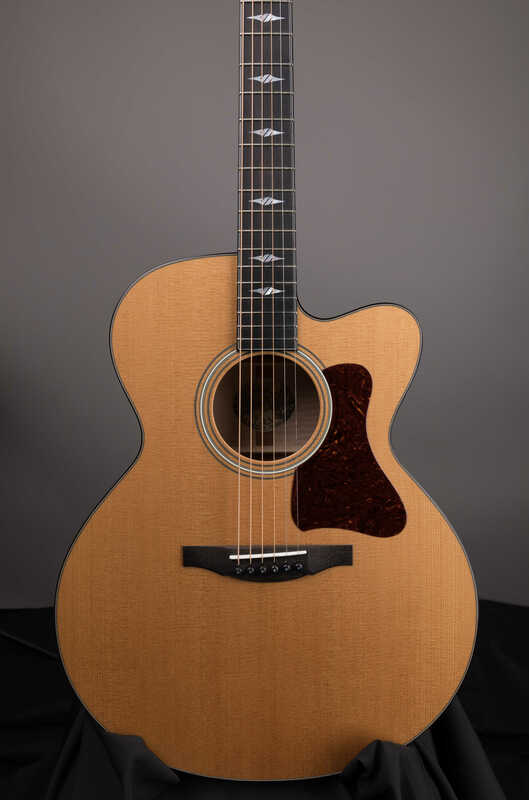 HAND VOICED From the starting point of the wood's density and rigidity, each acoustic guitar top is hand selected, evaluated, and carved to its own unique thickness; maximizing the tonal potential of each top. SJ TONEWOODS The Collings SJ is constructed of all solid woods that are acquired, acclimated, and hand selected by master luthiers here at our shop. The SJ includes a premium flame maple back and sides with a black/white maple backstrip as standard. PLAYABILITY A combination of exacting PLEK machine leveling and hand fret dressing ensures consistently excellent playability and a silky fret feel. FINISH By meticulously hand-sanding between coats, our nitrocellulose lacquer finishes measure between .005 and .007 inches in final thickness, maximizing acoustical response while providing excellent protection and aesthetics. HARDWARE Premium Waverly open gear tuners offer exceptional tuning stability and smooth reliable operation. SJ APPOINTMENTS The SJ features a fully bound top, back, neck and haircut-style peghead with black/white top purfling. 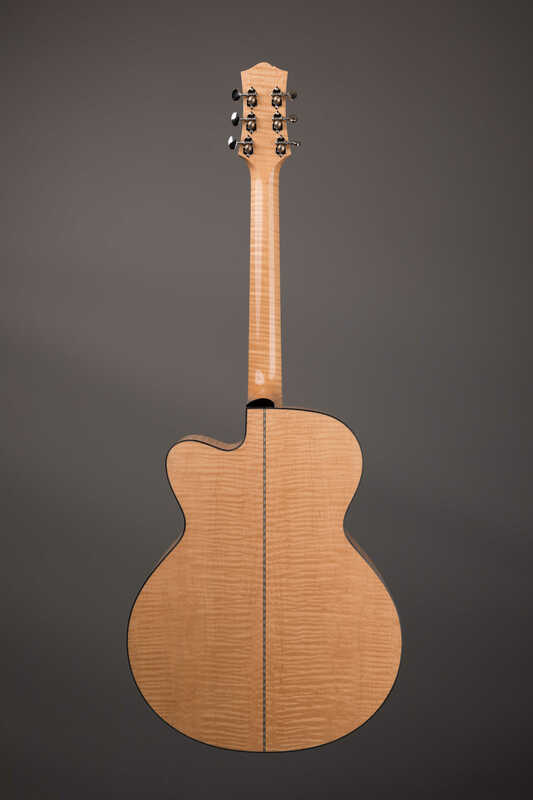 SJ NECK PROFILE Each SJ features a comfortable medium-fat C shaped neck profile with 2 3/16 inch string spacing. 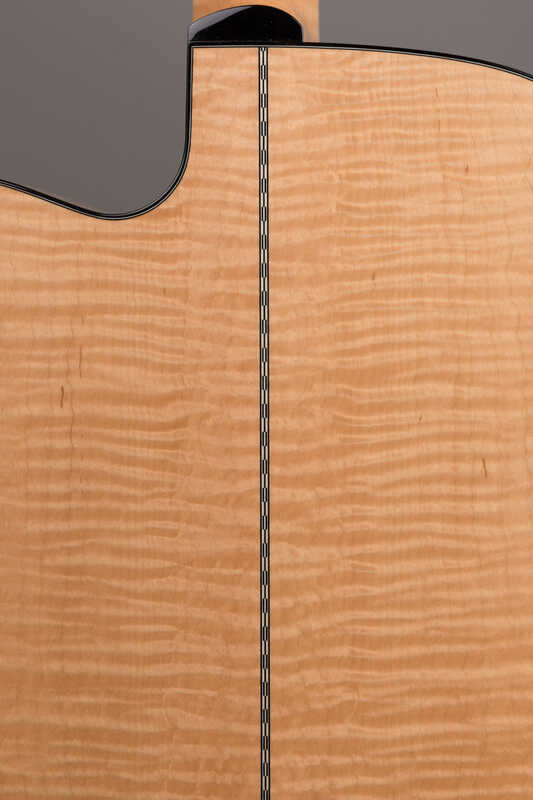 HAND VOICED From the starting point of the wood's density and rigidity, each acoustic guitar top is hand selected, evaluated, and carved to its own unique thickness; maximizing the tonal potential of each top. SJ TONEWOODS The Collings SJ is constructed of all solid woods that are acquired, acclimated, and hand selected by master luthiers here at our shop. The SJ includes a premium flame maple back and sides with a black/white maple backstrip as standard. PLAYABILITY A combination of exacting PLEK machine leveling and hand fret dressing ensures consistently excellent playability and a silky fret feel. FINISH By meticulously hand-sanding between coats, our nitrocellulose lacquer finishes measure between .005 and .007 inches in final thickness, maximizing acoustical response while providing excellent protection and aesthetics. Whether you're interested in this SJ ss c, or something completely different, I'd love to take some time to help you find your next instrument.